Data warehouse and OLAP systems are tools to support decision-making. Geographic information systems (GISs) allow memorizing, analyzing and visualizing geographic data. In order to exploit the complex nature of geographic data, a new kind of decision support system has been developed: spatial OLAP (SOLAP). Spatial OLAP redefines main OLAP concepts: dimension, measure and multidimensional operators. SOLAP systems integrate OLAP and GIS functionalities into a unique interactive and flexible framework. Several research tools have been proposed to explore and the analyze spatio-multidimensional databases. This chapter presents a panorama of SOLAP models and an analytical review of research SOLAP tools. Moreover, the authors describe their Web-based system: GeWOlap. GeWOlap is an OLAP-GIS integrated solution implementing drill and cut spatio-multidimensional operators, and it supports some new spatio-multidimensional operators which change dynamically the structure of the spatial hypercube thanks to spatial analysis operators. A Data Warehouse is a centralized repository of data acquired from external data sources and organized following a multidimensional model (Inmon, 1996) in order to be analyzed by On-Line Analytical Processing (OLAP) applications. OLAP tools provide the ability to interactively explore multidimensional data presenting detailed and aggregated data. The results of analyses are the basis of strategic business decisions. It has been estimated that about 80% of data in databases contains geo-referenced information (Franklin, 1992). Geographic Information Systems (GISs) allow memorizing, analyzing and visualizing geographic data. OLAP systems reduce geographic data to simple textual data. Therefore, they do not present any cartographic representation of geographic data. On the contrary, maps are fundamental for the spatial decision making process because they stimulate user’s cognitive process, and reveal hidden precious geospatial information. Therefore, some solutions, called Spatial OLAP, which integrate GIS cartographic visualization and interaction functionalities into OLAP systems, have been developed. Spatial OLAP (SOLAP) is “a visual platform built especially to support rapid and easy spatio-temporal analysis and exploration of data following a multidimensional approach comprised of aggregation levels available in cartographic displays as well as in tabular and diagram displays” (Bédard, 1997). Spatial OLAP systems integrate advanced OLAP and GIS functionalities (Rivest et al., 2005; Kouba et al., 2000). They visualize measures on maps at different spatial granularities revealing relations between facts and dimensions (Bédard, et al., 2001). Moreover, maps allow triggering spatio-multidimensional operators through simple mouse clicks, also. Different SOLAP models have been proposed. They address various aspects of geographic information allowing to model different spatio-multidimensional applications. SOLAP applications can address several and different domains: environmental studies, marketing, archaeology, epidemiology, etc.. SOLAP models define the concepts of spatial/geographic dimension, spatial/geographic measure, and spatio-multidimensional operators. The integration of spatial data into multidimensional models and systems rises several theoretical and implementation issues. Therefore, in this chapter, we introduce main OLAP and GIS concepts. Then, a detailed review of SOLAP models, architectures and research SOLAP tools is presented. 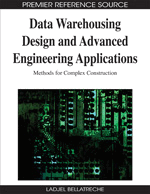 The chapter describes our Web-based prototype for the analysis of spatio-multidimensional databases (GeWOlap) (Bimonte et al., 2006; Bimonte et al., 2007a, Bimonte et al., 2007b). We describe main architectural features, and we present spatio-multidimensional and GIS operators using a study case concerning pollution in French cities. Main outcome and limits of our approach as regards to existing SOLAP tools are detailed, also. Finally, future research directions in spatio-multidimensional visualization and interaction are discussed.